Unified Communication market is still in the nascent stage and major demand for these solutions is seen from large scale enterprises. However, with the increasing expenses of business enterprises the demand is expected from SMB market as well. 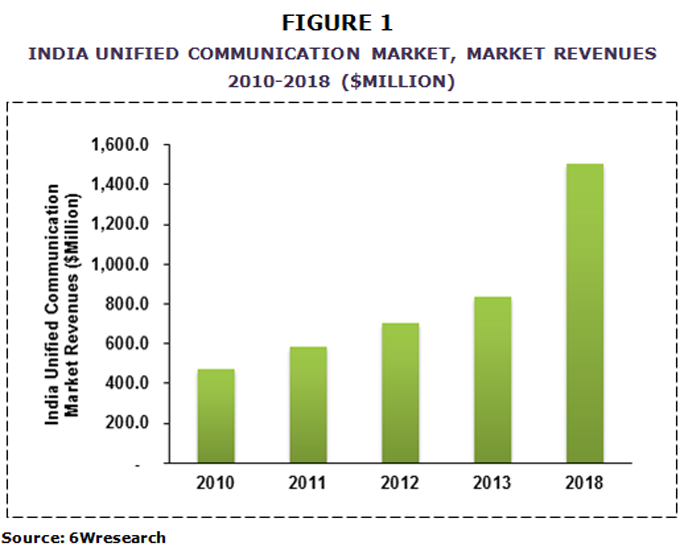 According to 6Wresearch, India Unified Communication market is expected to reach $1,506.2 million in 2018, at a CAGR of 12.4% from 2013-2018. Voiced based unified communication solutions have captured major pie of the market revenues in the India unified communication market. Communication at affordable price and its ease of usage has led its market dominance in the Indian market. However, conferencing unified communication is emerging as the fastest growing UC market in India. This market is expected to gain pace on account for growing demand for video conferencing solutions. With video conferencing an organization can directly get in touch with its branch or partner or customers from a distance. This significantly helps to reduce the time and travelling cost incurred by the company; thus optimizing the operational expenses. Another major advantage associated with video conferencing is that these can be accessed from laptops, desktops and even from tablets & smartphone, which has resulted for its rising demand amongst various organizations. The report thoroughly covers the market by unified communication market solutions, by applications and by regions. The report provides an unbiased and detailed analysis of the on-going market trends and market segments. The report also gives the insights on key market drivers, restraints, opportunities and trends that shape the present and future market.